You can subscribe here to be notified when this page is updated with new fishing reports. Don't Miss Out Ring Now!!! A seahorse kontiki was recently lost to sharks at Murawai Beach. Another seahorse kontiki broke off at Matata recently (before the floods) and was lost. Both owners are offering rewards for the return of the devices. They are red electric kontikis with the handle moulded into them. Please ring 634-5005 to check if the serial numbers of the lost seahorse kontikis match those on the unit you have found and for details on collecting the reward. We went fishing with my new kite rig that I had bought from Paul's kite shop in April. This is my first kite rig and I was prompted to get one after having tried a friends. I took a day of work on Wednesday 13th April for a test run. We went to the end of Muriwai and had a superb day until the air force removed us due to munitions demolition practice going on behind the dunes. We had not seen the red warning flag as we had come on to the beach at about 5.30am. We only caught four very nice sized kahawai on the first try, but when we used the kahawai for bait we managed a catch of nine snapper that were all about three kilograms each. I am very impressed with the Paul's kite rig set up and ease of use, and hope to get more fish next time, would have had more this time but air force dragged us of the beach after only two and a half hours fishing. 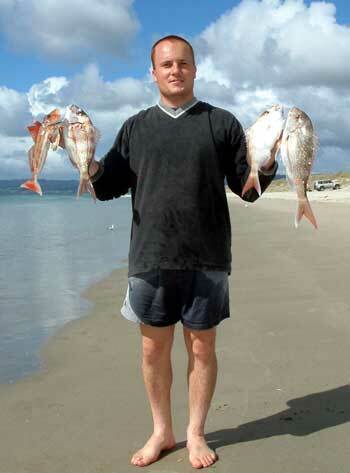 We found the fish in the photo on the right about 15 kilometers up Muriwai Beach. It looked like a shark had taken a bite but the fish was still very fresh. Photo : The 2 kahawai weighed in at 2.4 and 2kg. My mate Mike and I went to try our new 65kg Deluxe dropper rig from Paul's Kites in mid March. 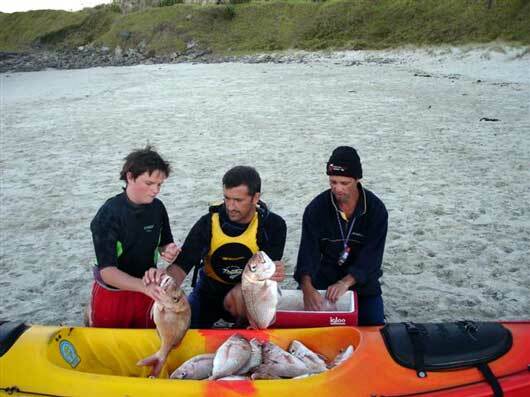 Having dreamt of a quick fish, and returning home with some food for the whanau we set out to Muriwai Beach. After discussing the wind conditions with the friendly staff at Paul's Kite Shop we agreed to try the Kaipara Harbour. We arrived at spot X at approximately 5:45pm, low tide was closing in fast and a friendly southerly wind was blowing. After several failed attempts at tacking the kites, we set out 11 hooks baited with fresh scaled mullet. Later, viewing the kite fishing video from Paul' shop, we realised that we had attached the plastic bag for tacking on the wrong kite! We set the rig out to about 900 metres into the mouth of the Kaipara Harbour, and looked at this eighth wonder of the world, a fishing kite that really worked and accommodates beginners! Wow, we were so stoked! After 15 minutes we decided to haul the first set in. Now for those of you who need some exercise, here's the best you can get. Running down the beach, grabbing the line and running back up the beach to the reel about 7 times before the float became visible. At first, when I saw the catch, I thought "crap, a bloody shark" then to my astonishment I realised it was a lovely kahawai followed by another. Yahoo, we had caught fish within 30 minutes of setting this baby out for the first time, unbelievable. We set out a again, keen to see more of these beauties, but after 15 minutes the tide was coming in fast, a wicked rip was playing its game as well, and it was time to pack up for home. We enjoyed the experience of our lives and had two great fish for the smoker. At home we cracked open some wine and my filleting guru mate Mike did his magic on the fish while I sat back and wondered.... "am I dreaming today? Nah, I can smell the fish! We prepared the fish for the smoker with salt and brown sugar at 11pm. By 11:30pm we were pigging out on our catch enjoying a boys night out. Who needs pubs and booze when you have a Paul's Fishing Kite we wondered. As the famous Swedish volley ball girls on the Tui advertisement say. "So what did yo wish for?" We went back to the same spot in late April and caught a good sized snapper with on the 65kg Kite Dropper Rig about 800m out into the Kaipara. 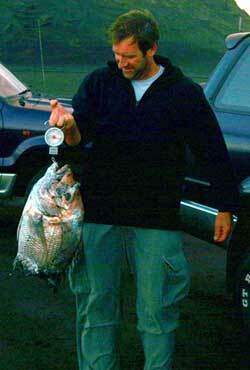 Above : Marius Botha and the 6.05 kg snapper which was 75cm long. When I was invited to join Paul of Paul's Fishing Kites for a days kite fishing, I jumped at the chance. It was to be my first experience with kitefishing so I had no idea what to expect. We travelled up to Uretiti Beach and arrived at our destination at 9:15am. After launching the kite, connecting the dropper rig and baiting up a set of 10 hooks with fresh mullet, our set was in the water by 9:30am. I've been on plenty of charter boats, and friend's boats, but the ease and speed of setting this dropper rig really took me by surprise. Setting the gear was effortless! Around one hour later it was time to bring the set in. A few walks up the beach and we had caught 4 snapper and one gurnard. It was a great feeling, I was amazed at the simplicity of this style of fishing and the reward of having caught a hearty meal in such a short time. We re-baited the traces where they lay still attached to the hook section and kept the ravenous seagulls away by putting a handful of sand over each bait, our set was back out in the water after just 15 minutes. Unfortunately, our second set was set over slack water and our baits were stripped clean from the entire set, a very important lesson was learned. Always keep the gear moving through the paddle crab zone. Our last set of the day caught two more fish, a snapper and a gurnard. Two hundred metres down the beach was an electric kontiki fisherman. His rig appeared to take a lot longer to set up and get into the water. After talking to him at the end of the day his catch was about the same as ours. I found the whole experience an exciting and worthwhile way to fish and am looking forward to my next outing. 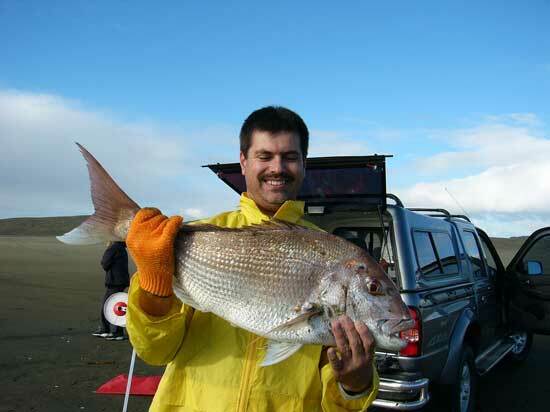 Ed : Gordon and I went out to Muriwai last Sunday in atrocious conditions and caught three kahawai, a snapper, two huge gurnard and a variety of sharks while testing our new kite winch on a dropper rig powered by a Power Chute kite. The kite was pulling 15 to 20 kilograms and the surf was a very ugly, dumping, three to four meters high. The rip was very strong and huge sweepers were occasionally surging high up onto the beach which made driving difficult after low tide. 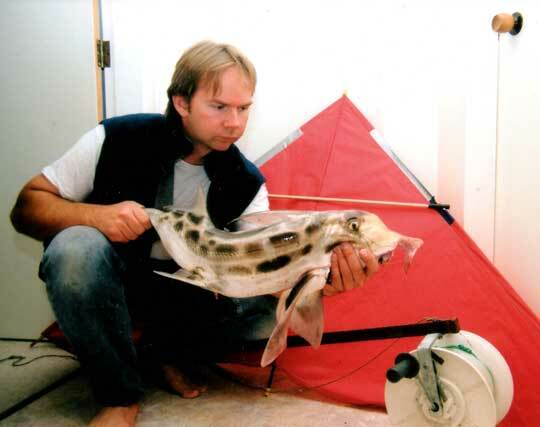 During the first week of January, 2005, I fished my kite longline rig off 90 mile beach. Using 5/0 Target Hooks and running just 20 hooks per set I baited up with mullet. 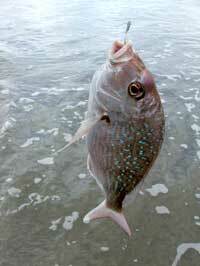 With a moderate wind blowing and an incoming tide I ran two sets for three snapper and a 6kg trevally. The rip was a problem this particular day and the gear wouldn't stay straight out offshore but tended to run up the beach at an angle. Editors Note: One of the problems with fishing a bottom longline rig on the west coast is the rip. You will find that during the first day or two of a northerly or northeast wind is when the rip is strongest. If you are lucky and the winds stay in that quarter for more than a few days, the rip does ease up and makes longline fishing much easier. Dropper rigs are by far the most efficient rigs on this coast as they are not affected by these strong rips. On March 28th, when my brother and I got to Waihi Beach with our Flexiwing Rig, the winds were a mild 15 knots. We launched the Flexiwing and attached the skyhook for a little additional power and baited up with squid. Suddenly the blue skies above turned black, the mild breeze of 15 knots raged to gusts of up to 100 kilometers per hour. 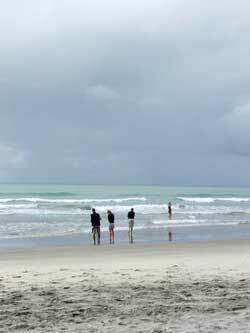 With thunder, fork lightning, and a tornado ripping through Waihi, there I was kitefishing! I was most impressed, the Flexiwing kite flew right through it all! It was a real struggle to pull the gear back in, the photo on the right shows the four of us hauling the gear in. Even with a fractured carbon rod, the Flexiwing kite never even looked like coming down. Wow, well done on the kite design guys! After talking with Peggy on the phone about replacing the broken spar and telling about our adventure, I mentioned it to my brother and he forwarded the photos. He managed to get a few shots immediately after our experience with the tornado on the beach. Unfortunately he wasn't game enough to keep the camera out during the torrential rain though. I even managed to catch one snapper, though it was left hanging around 100 metres in the air for a while during the worst of the storm. The snapper in the photo was 290 mm, sorry we didn't get a chance to weigh it, a bit busy and overwhelmed by the weather. While it was just a small snapper it was definitely worth keeping due to our effort expended in catching it! 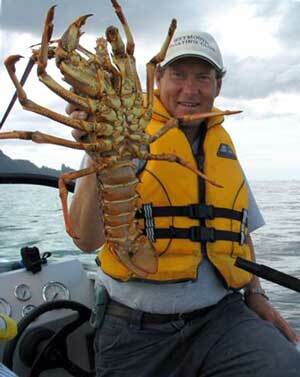 Hi all, thought I should drop you a line about the fishing in Wellington. Well it's been hard going this summer but a few elephant fish are getting caught off Seatoun beach. Fresh squid bait appears to be working best. Ten of us went to Wellington last week and tried for some Cook Strait hapuka, cod and tarakihi. We didn't get onto the puka, apart from a single specimen, but we did manage quite a few of these monster blue cod. I was using a piece of cray leg shell over the shank of a 5/0 Target Snapper Hook then a cube of squid hanging from the gape of the hook. Photo above: This monster cod was taken on the top hook of a two hook ledger rig. We were surprised when Sean hooked this 7 pound big red crayfish on a 4/0 Target Hook ledger rig with a cube of frozen mullet for bait. It was well hooked on a short feeler near the mouth and really took some effort to remove. Amazingly, the spot was quite close to the ramp, sorry, further detail is top secret! 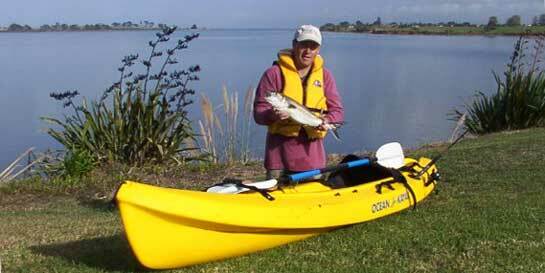 Photo below : I couldn't resist an early morning paddle today from Major's Bay, Wattle Downs, on the Manukau Harbour. 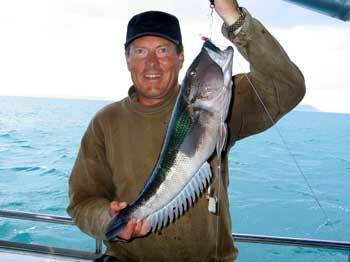 I towed a baited target hook on the off-chance and got this kahawai for my troubles. Had time for a quick shot with the 25 hook boat longline this morning and came up with this fine 2.5kg snapper and 16 of his mates. The line was set 3 times. Well I'm back out kayaking again with my old mate Peter Vesetolu and once we managed to overcome the breakers that were dumping us on the way out we managed to get a few nice sets in. We baited the Paul's Fishing Kites boat longlines with mullet and caught over 20 snapper between us over the day. We also caught a trevally, a kahawai and four sharks. 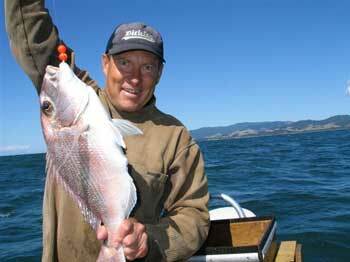 Peter was hopeful of catching a bigger snapper than I could as Te Arai is favourite place to go... Sorry Peter... Got you again me old mate! Mako sharks around one meter long were in deeper water of about 70 feet and were following the snapper up. This gave me the creeps even though they were small. My apprehension soon passed once we were all steadily catching nice snapper. Hope to be going out again soon. I recently bought some 80lb spectra line and I just couldn't find a knot that would hold. I then found your instructions on the web and tried it out. Last week I went on a weeks fishing trip with my brother and we hooked a 7ft Mako shark, it was a great test for your knots. I am happy to say that we had the Mako on for about 45 minutes, and what a fight it put up! We got it to the boat and relaxed the tension on the line a bit to get a knife to cut the mono leader but before we got the knife the Mako dived away. The spectra pulled into itself on the reel and amazingly the 120lb leader busted! I am totally amazed that a granny knot can provide such knot strength. Thanks very much indeed for a magic solution. We are back home after an awesome week away. 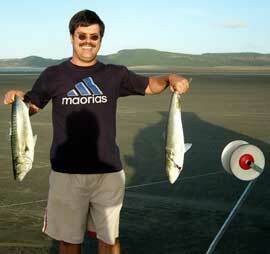 Had really great fishing at Spirits Bay. 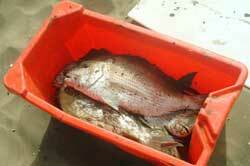 In two sets we got a 5 kilogram snapper, one at 4.5kg, two at 4kg, three at two and a half and a few pan size snapper. We made a lot of the campers up there really happy. The kites I used were a Flexiwing with a skyhook underneath for a bit more power. The combination worked really well. I just can't seem to kill that Flexiwing kite. Forgot to take camera damn it. Our family of five set off to the spot at 12:30pm. Once we reached the end of the road we had a long walk ahead of us, especially as we were carrying a 20 kg kayak about 700 metres over sand. At last we reached the water and wasted no time in setting up the hooks and the bait before Dad paddled the longline out, the surf was big but it did not stop him. Dad went out to sea about a kilometre before dropping the sinker and heading back. Just as he was thirty metres away from shore a 1.5 metre wave unexpectadly rose up from behind and flipped him off. He made it to safety with the aid of my older brother, but without the oar.We have to catch something now since we lost the oar, Dad said. Fifty minutes later we were pulling in the line and could feel the fish struggling to stop the line. We saw our first fish which was a good size snapper. More and more snapper started to come in as we were battling our hearts out. Huge Snapper,yelled my mother. We all ran down to the last hook to see the snapper until realising it was not a snapper after all, it was a 3 kilogram trevally! We all headed home with our heads high and waiting for our fish to be sizzling in the pan. I had a great day kite fishing on Easter weekend off Whiritoa Beach. Fishing a large 65kg dropper rig in a southwest wind I ran just one set of 24 hooks for the day and wound up with 7 good sized snapper up to around 2 kgs. I only ever use squid for bait, even when fishing on the west coast. I find that, overall, the results I've achieved have been in favour of the squid. I recently had one of the greatest fishing days I had ever experienced while rod fishing off Rakino Island in a light southerly wind. Using a combination of pilchards and squid for bait, I not only caught over 20 snapper, I also picked up a baby yellowfin and one kahawai as well!